As it turns out, when you have an unknown object jammed in the bottom of your foot, and you can't walk very well, you might not have the desire to go out for a nice dinner - even though it is a Friday night, and your husband has offered you a killer date. Instead, with sharp pains in your foot, you walk out of the Minnehaha/Lake Street Target, and notice Hiawatha Pizza, next to Cub, and you say, "Let's try that place." As we walked in to Hiawatha Pizza, we peeped the "Soda and a Slice for $2.99" sign. We were greeted by the owner, who (I believe, but am not positive) introduced himself as Assam. He asked us if we'd ever been there before. We said "no." 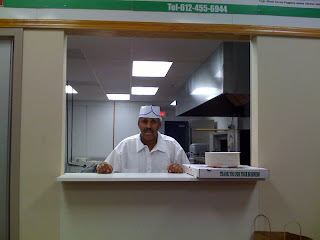 He offered us a trial slice of his New York style cheese pizza on the house, urging, "Try my pizza." Assam explained from the window, "I came from New York. I've been a pizza man for 20 years." After the sample, we decided to order a fresh pie, and we liked the pie, overall. We waited for about 20 minutes for the pie. The pizza wasn't earth shattering, but it was decent. The fresh pie was better than the slice. Assam explained to us that Hiawatha Pizza doesn't offer sausage on the menu because he is trying to serve up pizza that is conscientious of his Halal customers. He does offer ground beef, chicken, and pepperoni, but no sausage. Now, I won't claim to be a New York style pizza expert. I've had it a few times on 2 trips to NYC, and I do love it. 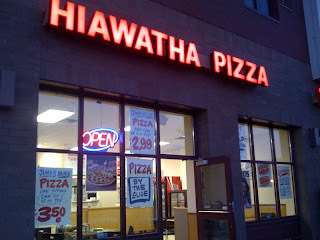 The best part of Hiawatha Pizza's pizza, to me, was the crust, which was perfectly fold-able. It flopped slightly when I picked up the slice from my plate, but it wasn't super floppy. The sauce was tangy and dense. As far as toppings go, I recommend trying the roasted garlic as a topping. Big, roasted chunks! 4 EVA! 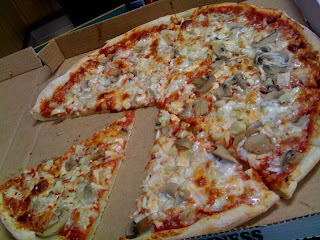 The mushrooms were canned, which I don't usually like for pizza (except for once in awhile) - I didn't like these mushrooms. We also had chicken on our pizza; it was unremarkable. I'm pretty sure they deliver, but they didn't have a menu to go, and they don't have a web page. I stopped there a couple weeks ago and didn't write about it because I thought the pizza was really bad. Assam asked me on my way out if it was the best pizza I've had in the neighborhood. I didn't really reply. I'll go back and try it again though. Aaron - I wouldn't give it "really good", but I wouldn't give it "really bad" either. To me, it was decent, and the price wasn't bad. The toppings need help, but the roasted garlic was good. I'm interested to see if your opinion will change. So no pepperoni either then - for real? Not sure about the canned mushrooms either. The roasted garlic sounds awesome. Sandra - Hiawatha does have pepperoni! There are manufacturers who make halal pepperoni with beef - not sure if that's what Hiawatha is serving though. When I asked about not having sausage on the menu, his response indicated that he wanted to be conscientious of his Halal customers. His response did not indicate that he was 100% Halal. You changed my mind and I went back to Hiawatha Pizza. Lot better than my first visit, and I'll be back. Aaron - Glad you liked it more after your second visit. I'll go back sometime too. I want to try the pepperoni. Thanks for the info, anonymous. I've corrected the phone number.